The automatic seamless loop engine and synchronized sampler lets the DJ perform astounding remixes live, with no preparation at all. The visual representation and the cues allow a DJ to clearly see the song structure, and never be surprised by a break. The vinyl controls will let you scratch like on a real turntable, except that with the beatlock engine your scratches will never end out of the beat. Add to that the infinite number of cue points a DJ can save for each song and large collection of wonderful automatically beat-synchronized effects. Lastly, enter the new era of DJs mixing video enhanced songs (DVD, DivX, MPEG...) which can be sent to monitors, TVs, a projector for display on a giant screen. 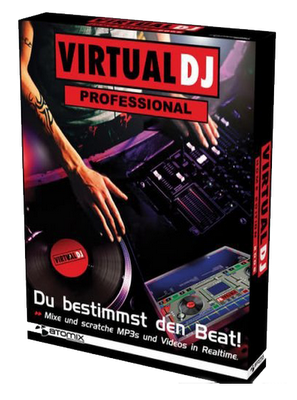 VirtualDJ brings all that and more to the DJ in the most easy-to-use way.